When problems like this happen, more often it is caused by one service or process utilizing larger amount of memory and CPU and that's where we start troubleshooting. This is the first troubleshooting step you should take before going any farther. A simple reboot will bring the phone back to its default settings. There is a possibility that while you are using your phone, one Google service was called into action and wasn't stopped by the system. Rebooting your phone will stop the service, apparently, while loading just the necessary services for the phone to function properly. 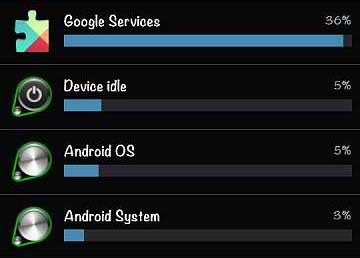 After the reboot, check the battery usage stats to see if Google Services is still on top of the list. If not, then the problem was solved. Otherwise, continue with the following procedures. 2. Tap Settings and touch More. 3. Tap Application Manager and swipe to left to select All tab. 4. Scroll to and tap Google Play Service. 7. Now check if Google Service battery usage dropped. If the problem occurred after you updated the Google Play Store app in your Galaxy S4, you may need to uninstall the updates just to see if they're the ones causing the problems. 4. Scroll to and tap Google Play Store. 6. Check if battery usage has improved. Check if there is a firmware update available for your phone. We are positive that an update would solve many battery-related issues because that's one of the things which Samsung set its focus on to. Factory reset would be your last resort to solve this problem. Did this work for you? Comment below or send us email at sebertech@gmail.com. Thanks for the help. This dropped my Google Services battery drain from 64% to 8% instantly. Now my battery drain is normal.